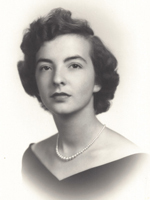 Patricia Jane Riley Easley, 81, passed away on March 29, 2019 at St Francis Nursing Center. She was a resident of the Virginia Peninsula for 39 years. Pat was born August 10, 1937, to Leo Riley and Jane Walker Riley in Croydon, PA. Pat graduated from Delhaas High School in Bristol, PA, in 1955. She participated in many clubs and activities, and served as Vice President of her senior class and Captain of the cheerleading squad. Pat met the love of her life and married Robert C. Easley in 1958. She traveled the world with him as a very proud Air Force wife for the next 27 years while raising four children. They were married for 52 years until Bob’s passing in 2011. Pat worked for the York County School System as a teacher’s assistant for 12 years. She will be remembered most as a loving, devoted wife and a selfless, caring, and proud mother and grandmother. Throughout her life, Pat enjoyed helping children, spending time with family and friends, and listening to music. Her deep and unwavering faith in God guided her every day. Her prayerful journey has led her to Heaven and she will be greatly missed. Pat was a member of Our Lady of Mt Carmel Catholic Church in Newport News. She was preceded in death by her husband, Robert, and her daughter, Patricia Easley Silva. She is survived by her son Robert and his wife, Charlotte, of Sumter, SC; sons, David of Yorktown, VA and Christian and his wife, Susan, of Waxhaw, NC; six grandchildren: Megan, Rachel, Christopher, Sullivan, Kevin, and Parker and eight nieces and nephews. A Funeral Mass will be celebrated at Our Lady of Mount Carmel at 2:00 PM on Saturday April 6, 2019. The family will receive friends one hour prior to the service starting at 1:00PM. Burial will take place later in the week in Pennsylvania. In lieu of flowers, the family requests donations in Pat’s honor to her favorite charity, St Jude Children’s Research Hospital.